Disney is testing a new touring strategy this year to win over preschool fans: less drama, more tunes. In what marks one of its first tours that doesn't center on a single cartoon or fairytale, the Disney Junior Dance Party features characters from a wide array of different Disney Junior franchises, from Vampirina to the Lion Guard, each performing their own numbers. The musical medley format allows Disney to swap new characters in for old ones without reworking the whole show -- Fancy Nancy made her debut performance on the tour this month, for example -- while helping the tour appeal to the broadest possible audience. "We wanted to include all of our shows, because when you're a parent and you're trying to decide what to see, if your child really wanted to see Puppy Dog Pals, maybe he wouldn't want to come to a show" that centered on a different Disney franchise, says Jennifer Doyle Rodgers, svp of brand development and integrated planning for Disney Channels Worldwide. "In the past, a lot of the shows have been more story driven, but this is really more music driven -- that was a little bit of a risk, but it's really paid off for us." 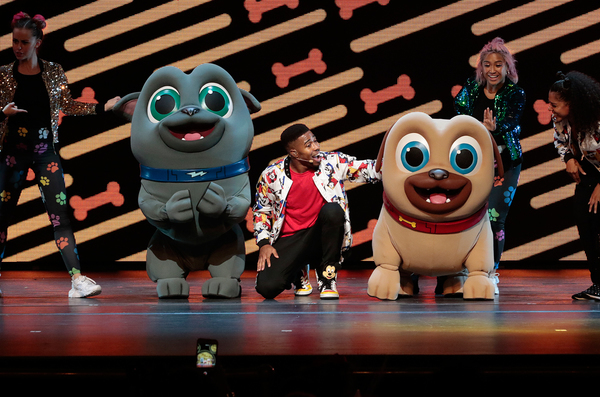 The musical tour began its 62-date second leg on Sept. 14 in Hershey, Penn., following the launch of the "Disney Junior Music" umbrella on streaming services like Spotify and Apple Music. Its playlists include the many of the same theme songs that soundtrack the Dance Party tour, with songs from shows such as "Muppet Babies," "Mickey Mouse Clubhouse" and "Elena of Avalor." The Disney Junior Music playlist has nearly 20,000 followers on Spotify, thanks in part to many parents' perception of Disney Junior as a "trusted brand," Rodgers says the company's research shows. Also helping drive ticket sales are VIP packages that allow fans to meet and dance with some of the characters, a rare opportunity outside of Disney theme parks. On Saturday afternoon (9/15) for example, at a hotel next to the Beacon Theater on Manhattan's Upper West Side, a few dozen young fans and their families snacked on pizza and pretzels, played games like freeze dance and learned several versions of the "hot dog dance" from two of the tour dancers, before Mickey, Minnie, Doc McStuffins and Elena filed in join the balloon-filled VIP party and pose for photos. Throughout the show itself - which includes plenty of additional dance instruction by tour hosts Dee and Jay as they hunt for a missing disco ball -- preschool fans grooved and jumped in the aisles, their faces appearing on a giant screen on stage when a videographer pointed the camera at them. The audience was showered at different times during the show with bubbles and confetti. Red Light Management's Jonathan Shank, who helped produce the tour, says the show's high level of "interactivity" is unique, made possible as family-oriented shows move into smaller theaters, a shift from years past where family entertainment lived mostly in big arenas. The biggest production challenge has been what Rodgers calls, well, the "magic." "Some of the magic we were using with our screen -- every time a character comes on, there's an element of surprise. From an audience perspective, a character just appears," Rodgers says. The hardest part, she says, was "making those characters come to life."